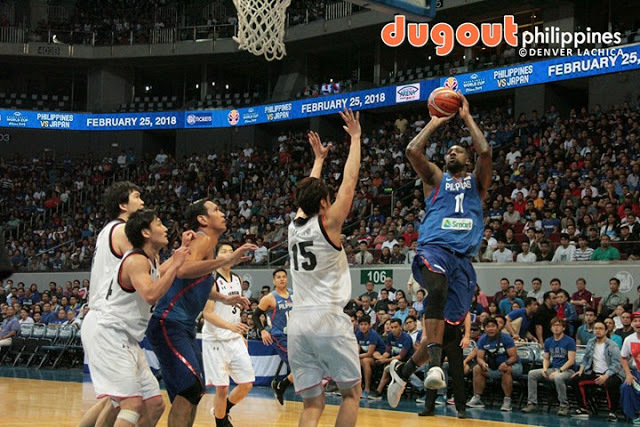 MANILA--Andray Blatche makes his way back to Gilas Pilipinas after he was named to the 14-man pool for the vital sixth window of the FIBA World Cup Qualifiers on Tuesday. Blatche, who served a three-game suspension for his participation in the infamous brawl between Gilas and Australia on July 2 in Bocaue, is set to swing back into action after also sitting out Gilas' last game, a home game against Iran in Pasay on Dec. 3. Also making a Gilas return is Mark Barroca. The Magnolia guard was part of the original Gilas lineup that played in the 2011 FIBA Asia Championship. The squad finished in fourth place that time. Completing the pool are Jayson Castro, Paul Lee, Scottie Thompson, Marcio Lassiter, Gabe Norwood, Japeth Aguilar, Poy Erram, June Mar Fajardo, Raymond Almazan, RR Pogoy, Chris Standhardinger, and Troy Rosario. Rosario's case, however, is a complicated one as he said on Sunday night that he may sit out the sixth window due to a broken nose he suffered in a tuneup game between TNT and NLEX on Dec. 29. Pogoy, on the other hand, will still need to sit out Gilas' road game against Qatar, the last part of his five-game suspension for his own part in the Gilas-Australia brawl, and will only become eligible to play when Gilas goes to Kazakhstan. Gilas must beat both Qatar and Kazakhstan to have a better chance of qualifying for the FIBA World Cup in China later this year.